I have been experimenting with Personal Kanban. I do a lot of things in my spare time, including managing a community website, running a photo blog, writing a book and helping to run meet-ups. Now on top of that put the other everyday chores, things like fixing stuff in my flat, renewing my motorbike insurance, taking my cat to the vet etc etc. I’m not unique in this, we all do a lot, “non-work” life is full of work, so how can we keep on top of it all and create space for the fun things? I work at Government Digital Service, were things are wonderfully agile. The project I am involved in draws on Kanban techniques to manage our portfolio of work and it’s something I have been looking to for help with managing my personal time. I’ll assume that readers have some background to Kanban (you can read more about it over here), so I won’t go into it in lots of depth, aside from saying it lends itself well to managing workflow and increasing productivity in all kinds of work rather than being as product focussed as something like scrum. So how can it be applied to home life to create a better life balance? The first most important thing for me is to get things out of my head and onto a board (or the back of my bathroom door in my case), so I can stop thinking about them. I find if I do this, then I can clear my mind and stop worrying about everything that I have to do. I use the Icebox column on my board to dump everything, this is in no particular order and things won’t get done unless they move into the Prioritised To Do list. (I also use Clear on my phone if I think of something I want to add to the list when I am not at home). What’s the most important things to do first? Next up is prioritising that list. What are the things on my list that are important to me and/or urgent? Importance for me is things that will make me happier, like: framing some pictures to put on the wall, booking a holiday or working on my book. Urgent things are deadline driven, like: renewing a passport before going away, fixing a leaking tap before the problem gets worse or writing a blog post about a new pub before it opens. Things that tick both boxes are the things to do first, like booking a holiday before flights get more expensive. The things that don’t fit into either of those buckets remain in the big Icebox unless they become more important or urgent. If they never become either, they don’t get done. Finally I try to limit the amount of things on the In progress, which allows me to focus on less things, no one works that well when they are trying to focus on lots of things at the same time. When I complete the things in that list, I can bring the next most important things over into the In progress list. It’s been an interesting exercise, like any agile practice it does take some discipline, but the payoff is worth it. I do find it helps me not feel overwhelmed by everything I have to do and there is always satisfaction in moving something to the done column. 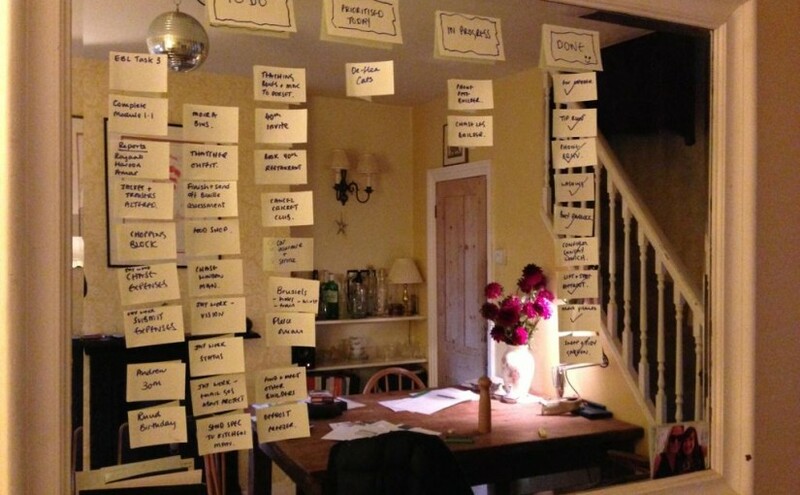 So can kanban make my home life better? Yes, it can. I’m going to try this! We’ve got quite young kids so it might be tricky, but what an amazing lesson – teaching a four year old a bit of agile! I love using this for everything, the idea of freeing up my mind is the biggest win. It’s also interesting to see the things that stay in the icebox for a while. What are your thoughts on using Digital board like Trello to manage this? Or do you think the physicality of the board helps. I use trello at home a lot for many things. It completely depends on preference. With only a tool like trello, the challenge that teams that only use digital boards remains, which is visibility, if your board is hidden on a screen, it’s not as impactful.